2017. 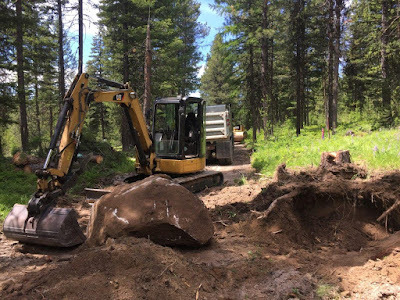 When snow stopped work on the North Summit Horse Campground (NSHC) in 2017, the campground had been surveyed, trees removed from designated road and campsite areas, and roads were laid out. 2018. 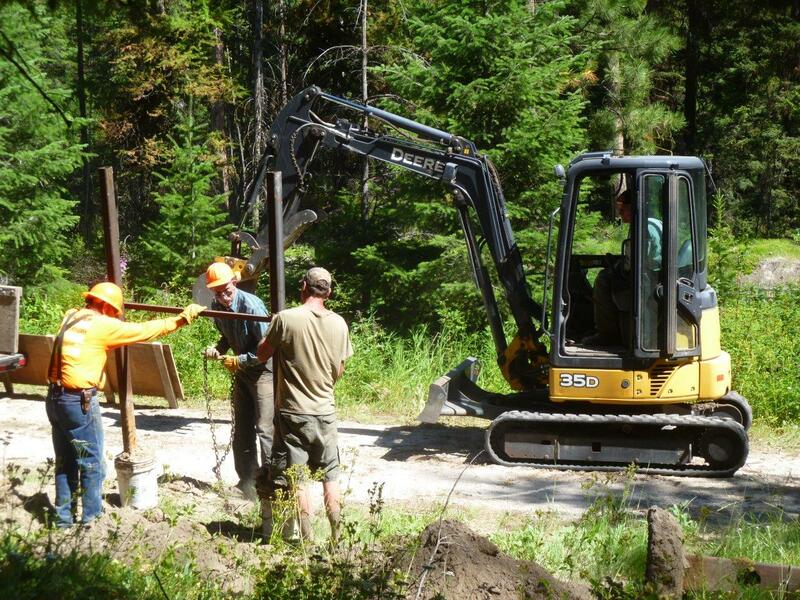 Work started again on June 13th, and continued through the third week of November. 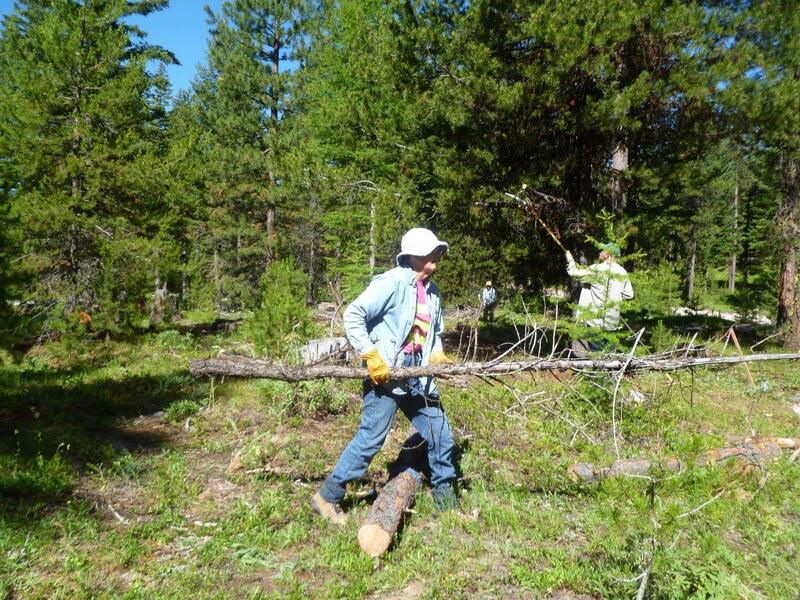 Over this period 1065 volunteer hours were accrued and costs amounted to $69,728. (From 2014 total expenditure has been $79,941). 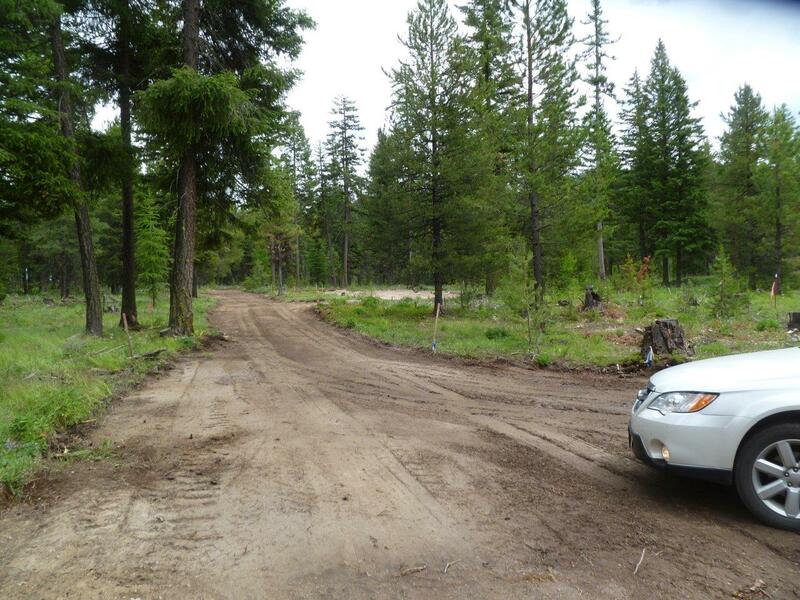 The roads round the campground have been cleared, leveled and developed along with the first six campsites. After inspection by the Forest Service Engineer, 1420 tons of gravel were spread, levelled and compacted on the roads and pull through and back in areas for the campsites. 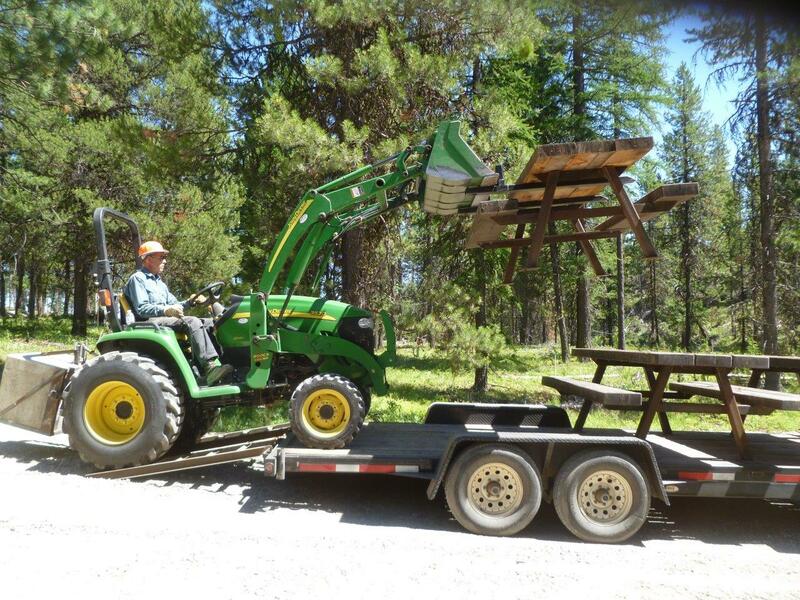 Campsite areas were cleared where the picnic table, fire ring and high line will be located. 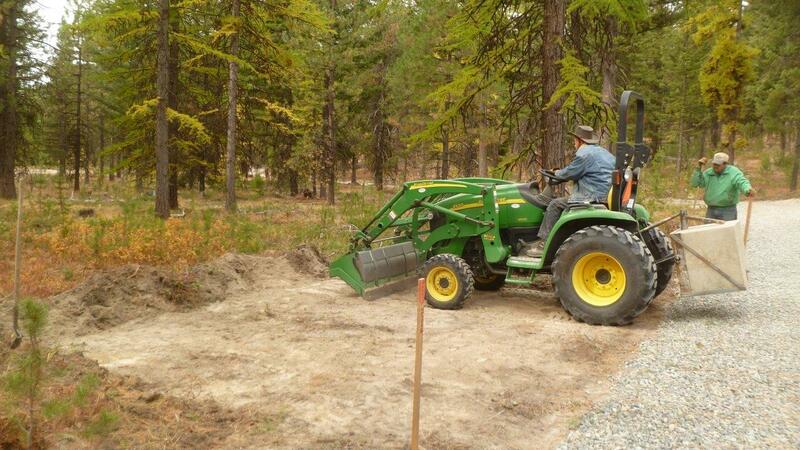 The area for picnic table and fire ring was leveled and graveled at each campsite. 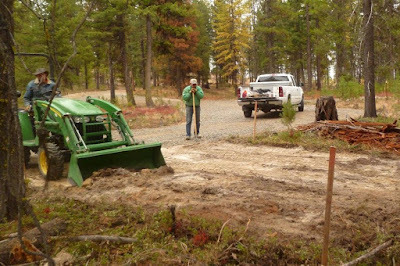 The future community meeting area was cleared. Contents of the decommissioned Forest Service JR Campground were moved to NSHC. 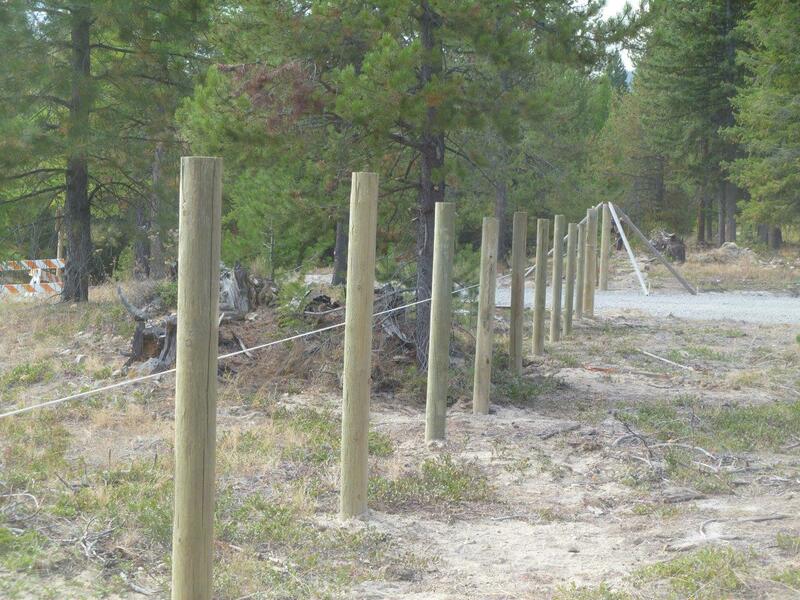 A 500-foot post and rail fence with a double gate across front of the campground. High line post/hitch racks were set in concrete at the six campsites and wood chips spread in three of the high line areas. 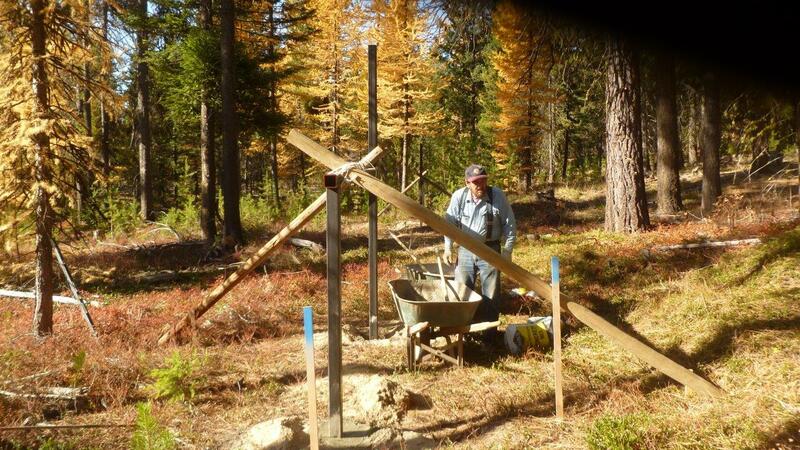 Three manure bunkers set up with ecology blocks. 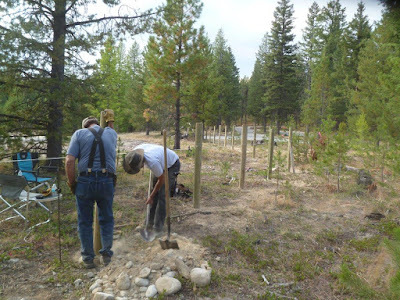 Transplanting work party moved young larches, rose plants and other species to areas with sparse vegetation. Move picnic tables and fire rings to prepared camp sites. 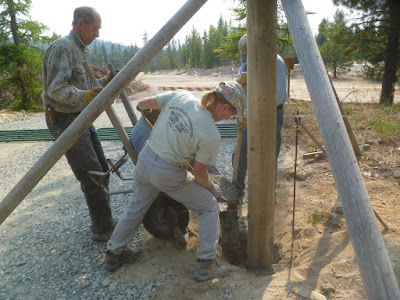 Concrete bases have to be made for the fire rings before they can be put in place. 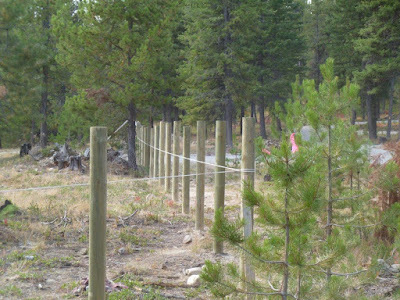 Put up high line wires. 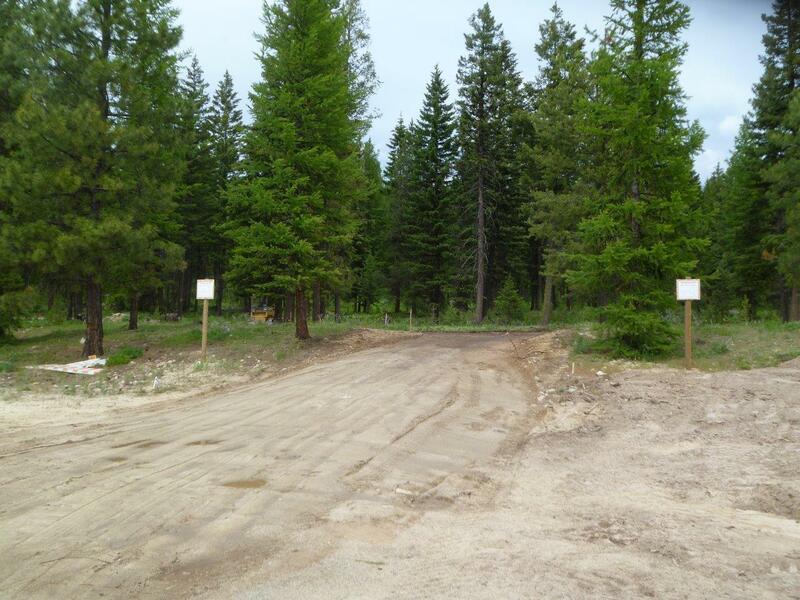 Put up signs (including campsite numbers and directional signs) within the campground. 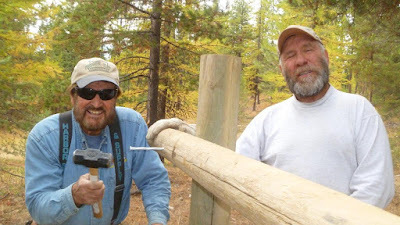 Erect two bulletin boards and pay tube. 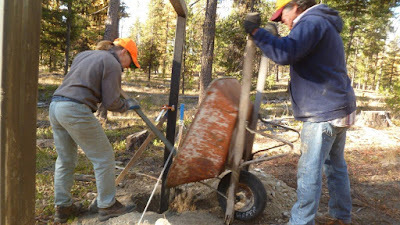 Build stone base for campground sign near the entry and erect sign. We hope that Phase 1 will be open for use in late spring. 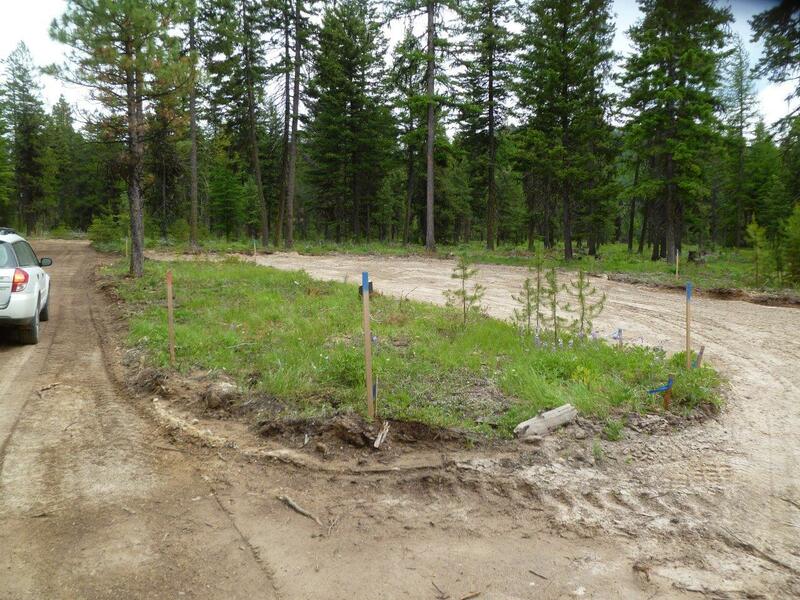 MVBCH has covered the major costs of Phase 1 (construction and gravel), using some of the income from our Spring Ride. Cash donations have contributed about 30% of the total funding needed for Phase 1. Large donations were received from individual and family members of our own chapter as well from family members of another chapter. 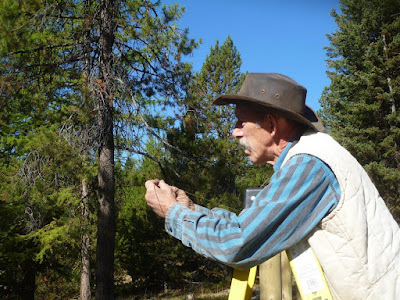 A generous grant was received from the Jack and Shirley McIntyre Foundation. 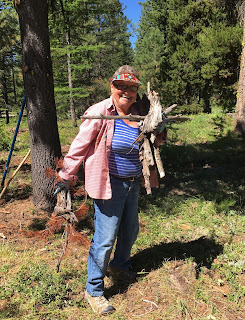 Buckhorn Range, Capitol Riders, Cascade Horse Club, Ferry County, Mt St Helens, Pierce County, Ponderosa, Purple Sage, Scatter Creek, Skagit, Tahoma, Wenatchee. Funding is being sought for Phase 2. 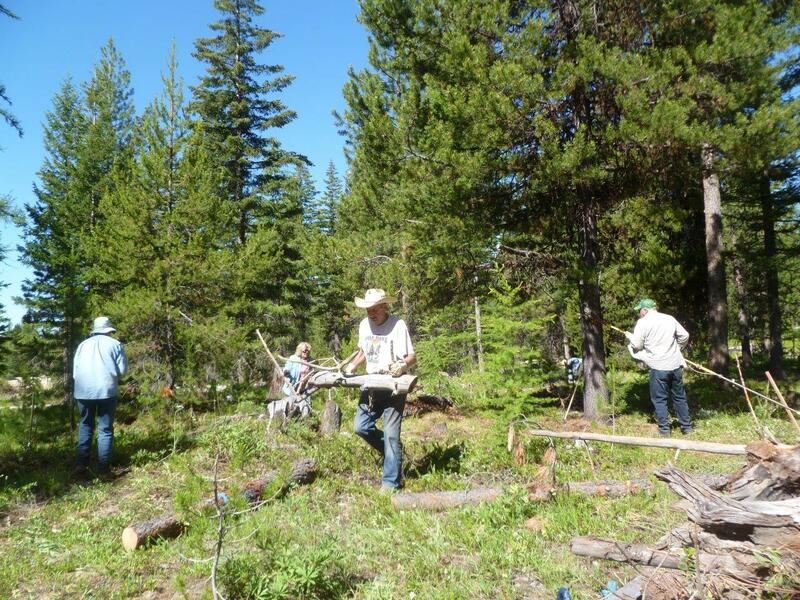 The FS and MVBCH are jointly applying for a grant to complete the campground. If successful, the campground will be completed when the grant becomes available in 2020. If not, it will be worked on piece meal as we get funds. 9//25 Putting up rails on front fence--ready and waiting. Since the report in the last Horse Tails there have been eight work parties on site. 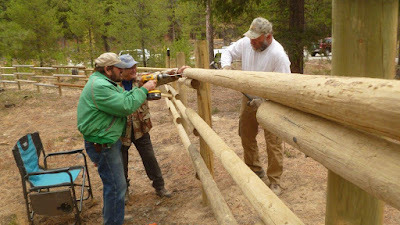 Three were to put up rails on the front fence, completed on October 1st. 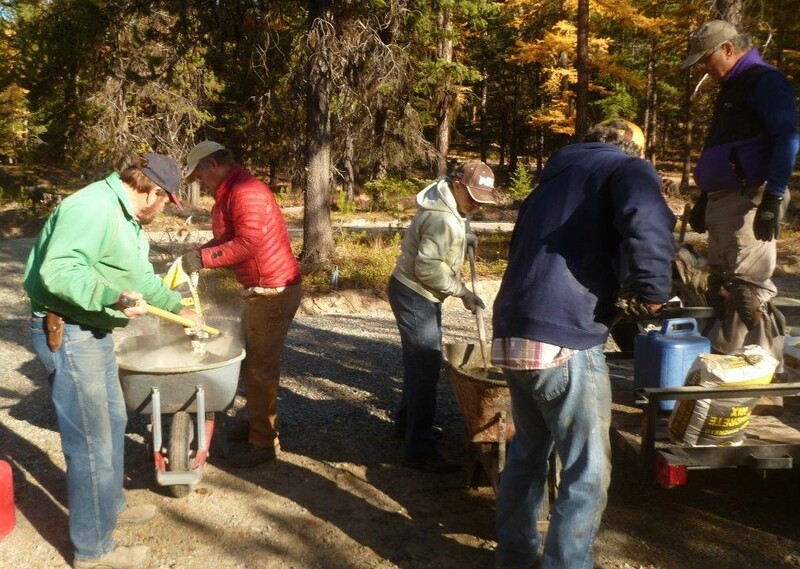 A work party on October 5th completed graveling the last two of the six Phase I campsites and cleared three sites for manure bunkers. The last four work parties were to put up the high lines at each of the six camp sites. On October 10th a tractor-driven auger was used to dig holes. On October 12th these holes were completed to 36’ depth by hand and high line posts/hitch rails were concreted in on October 18th and 19th. 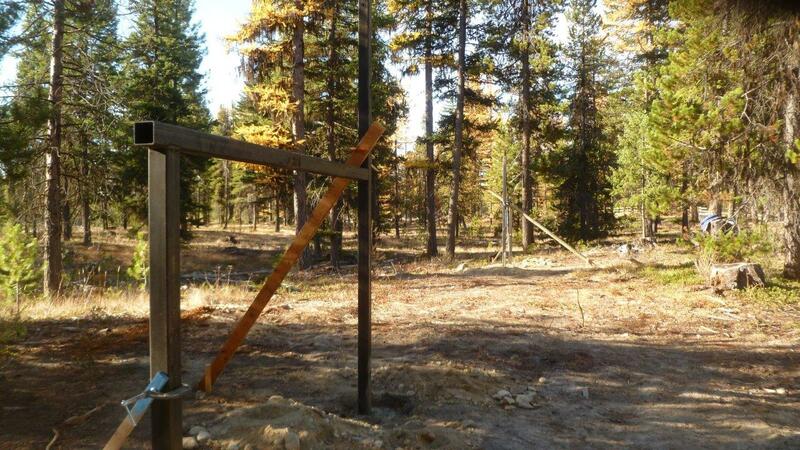 The last campsite should be completed on October 21st as there were too few people on the 19th to lift the steel post/hitch rails into position. We have already passed 900 volunteer hours on NSHC this year. Since starting in June and we have mixed and poured over 9,000lb of concrete in wheel barrows. In addition Bill, along with Pete and Cathy spend considerable time on administration. 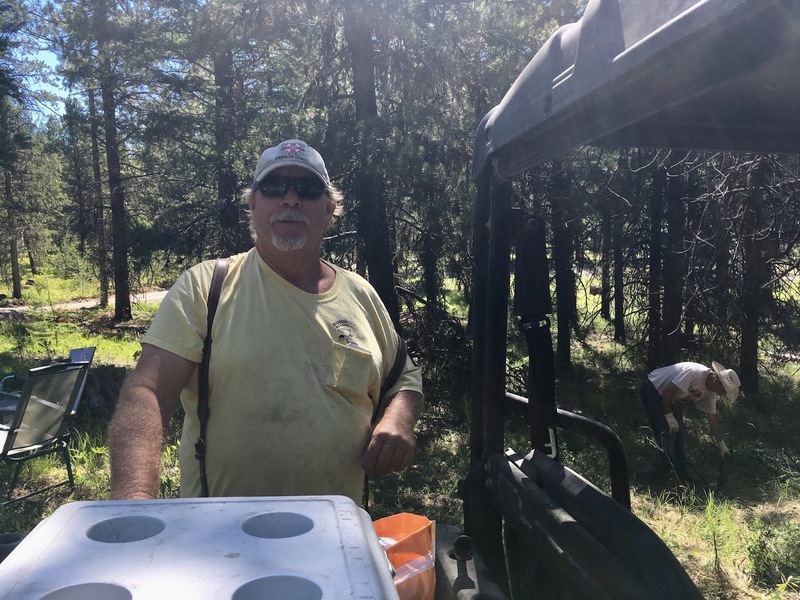 Currently Bill is working with Rosemary Seifried on a large grant application which the Forest Service is submitting for Phase II of NSHC. The dead line is October 31. 9/25 Putting up rails on the front fence. 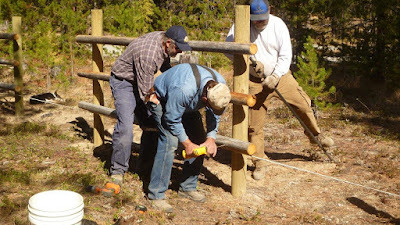 10/01 Putting rails on the fence. 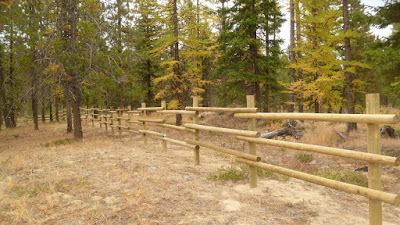 Finished west end of fence. Hand- dug holes west of entrance. 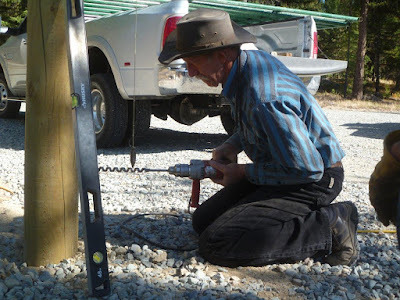 Ready for posts. 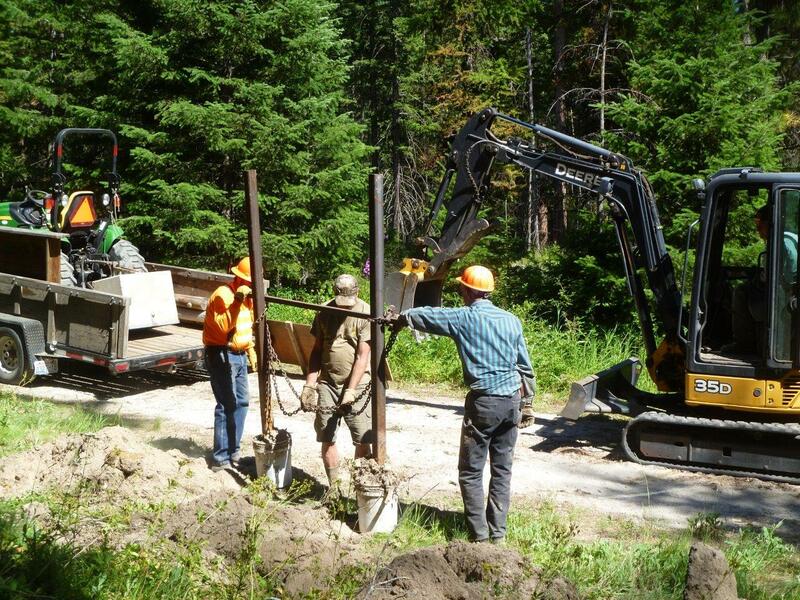 Moving highline post assembly off the flat bed. 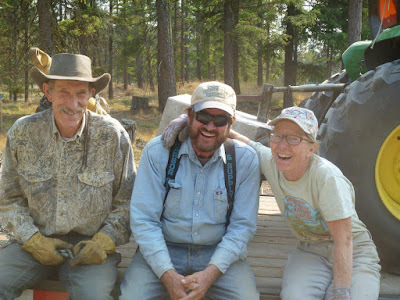 Terrific Trio Pete, Bill, and Cathy at the end of the day, and the photographer was laughing too! NSHC was a quieter place in August than it had been in July. 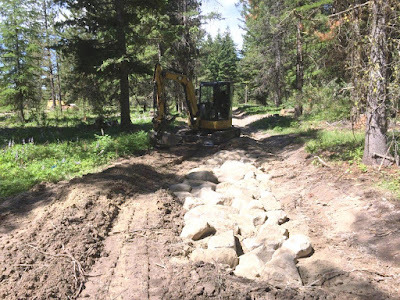 Gravel deliveries for the roads and Phase 1 pull-through and back-in sites were complete and Mike McHugh’s big machines had gone to other projects. 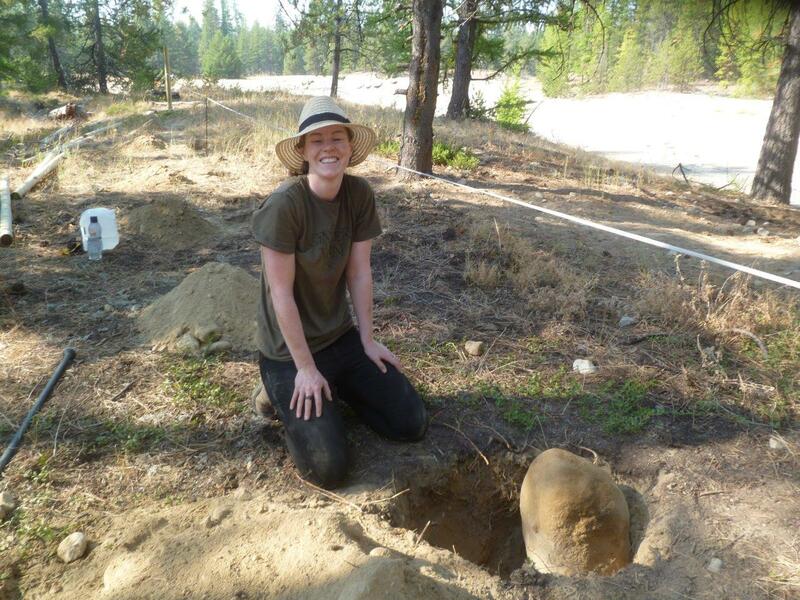 The great milestone this month was receiving APPROVAL of the GRAVEL from Lori McAllister, the FS Engineer on August 15th. This is a real cause for celebration. There have been numerous work parties, both on and off site, starting on August 1st with clearing some of the campsites. On August 8th Pete brought his tractor and, with the ground support of Mark Brantner (and his dog "Lucky"), and Bill and Jan Ford, he moved and smoothed out gravel in a few places, moved vegetation off camp sites and transferred a picnic table where it could be used in a shady spot near the communal area. 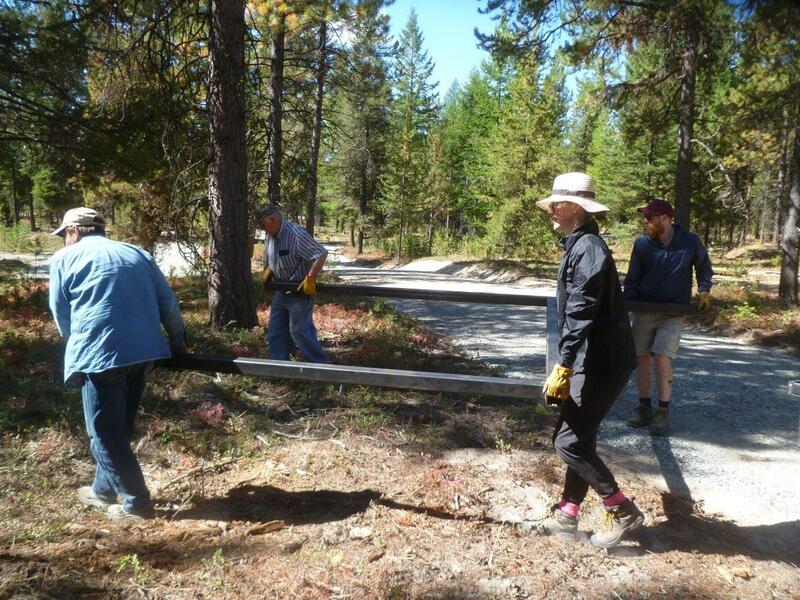 Work continues on campsites and on getting ready the tables, fire rings and high lines for each of them. 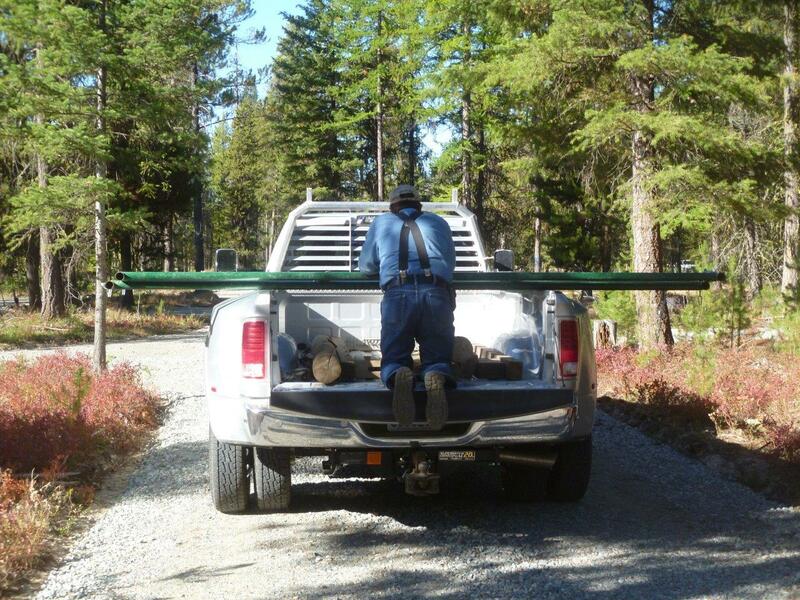 Steel has been purchased and delivered for high line posts, hitch racks and table legs. 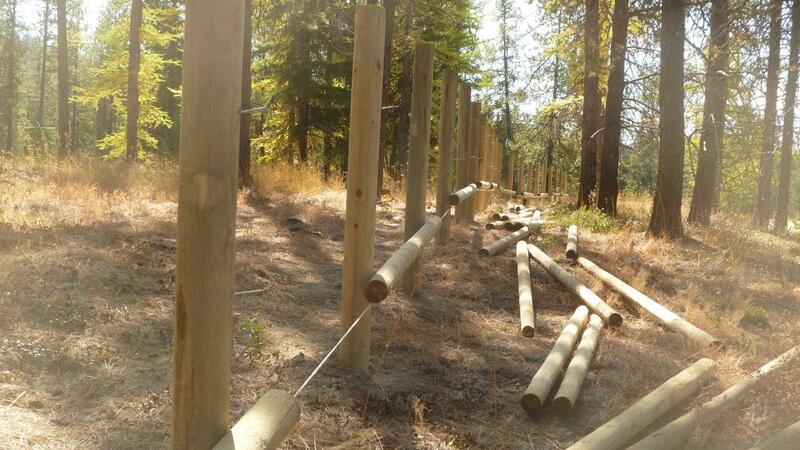 Brett Koke (Cathy and Bennet’s son-in-law) has nearly completed welding the high line post/hitch rack combinations. Pete, assisted by Bill, has drilled the holes to take the bolts for the lines. Other materials, such as concrete needed for the fire ring bases and setting up the high line posts, are being acquired. Apart from the campsites, Bill and Pete have worked on the materials and layout of the front fence. We may have to wait to build this because of fire restrictions in the forest. 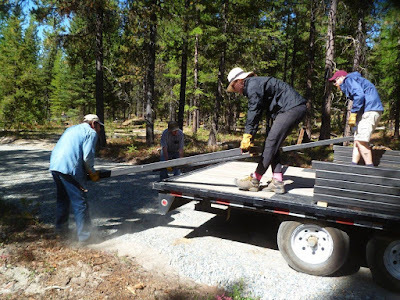 Work planned for the rest of August includes levelling and gravelling the campsites ready for placement of the tables, fire rings and high lines. 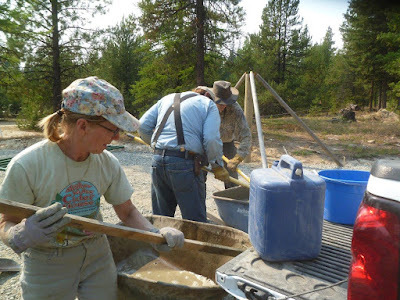 We are still actively seeking funding in the form of grants and donations. 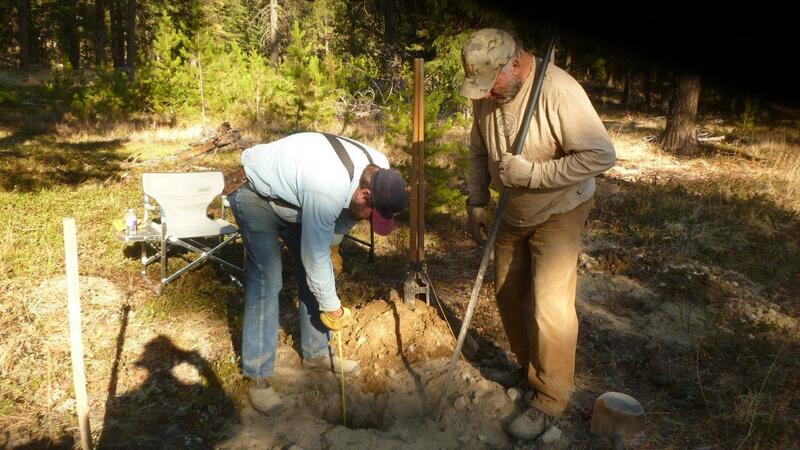 As a chapter we have used a lot of our own funds accumulated over the last seven or eight years, or more. Several individual or family members from MVBCH and from one other chapter have given substantial donations. We are particularly grateful to three other chapters of BCHW who have sent donations: Wenatchee, Ponderosa and Pierce County; we hope others may follow suit. 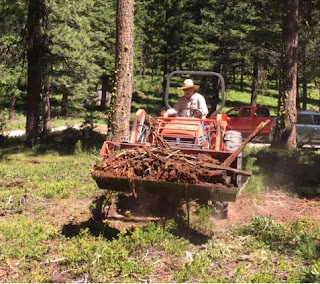 To see photos of the most recent progress, please click here to open our August "Horse Tales" newsletter and see pages 5 and 6. The Methow Valley Chapter of BCHW (MVBCH) first reported on developing the North Summit Horse Campground (NSHC) at Loup Loup in the March/April edition of THN this year (2018). 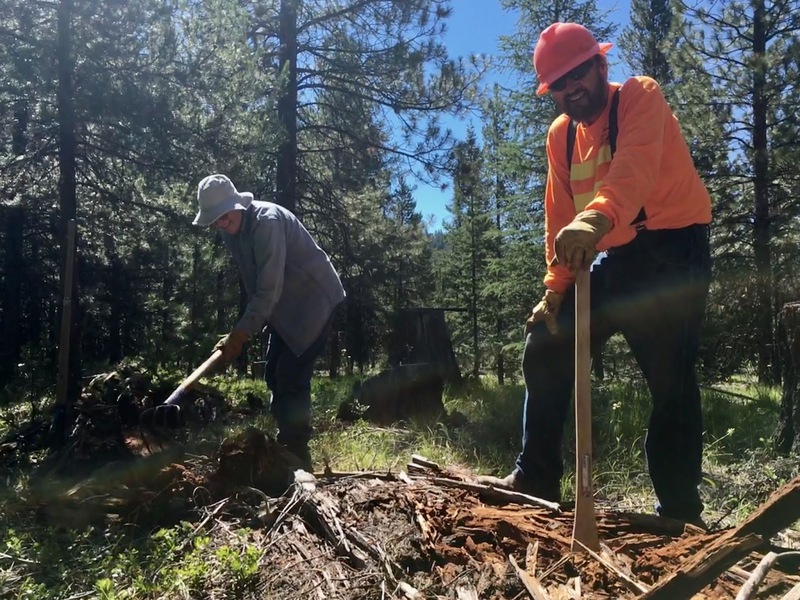 That report told how, when snow stopped work in 2017, the campground had been surveyed, trees removed from designated road and campsite areas, and internal roads laid out. On June 13th this year, after the snow had gone and machinery could be brought on site, construction work started again. 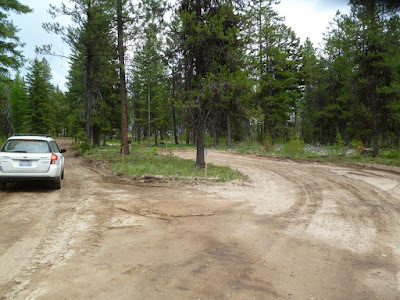 The road round the campground was further developed and the first six campsites (five pull throughs and one back in) were cleared. After further levelling and rolling, the Forest Service Engineer visited during the last week of June and indicated changes and additions that were needed. 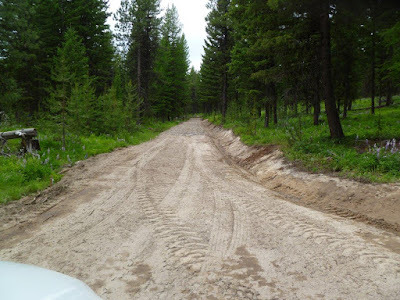 When the roads had been widened in places and more fill had been added, a further inspection took place on June 28th and, this time, the roads and campsite pull outs were accepted as being ready for graveling. The first loads of gravel were delivered on July 2nd. This was a red letter day for us. 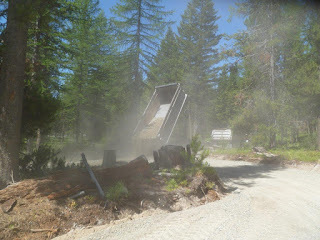 Five loads of gravel were hauled from Winthrop that day, and another eight days of delivery followed, finishing on July 18th. In all, more than 1420 tons have been purchased so far – costing over $25,000. 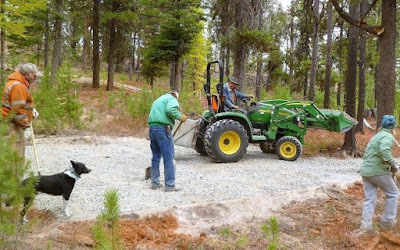 The cost of spreading, levelling and compacting the gravel is substantial. It has involved an impressive array of machinery and a lot of operator time. 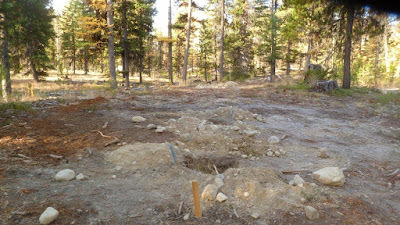 Total construction costs, including preparation for graveling, are at least $36,000. Six inches of gravel must be laid on the roads and on the pull out camping areas. 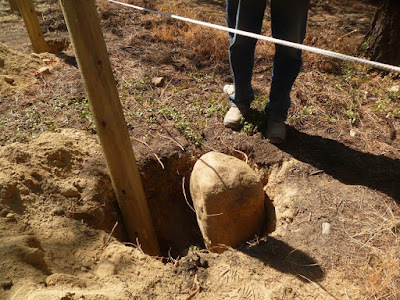 The six inches have to be compacted to an average of four inches. 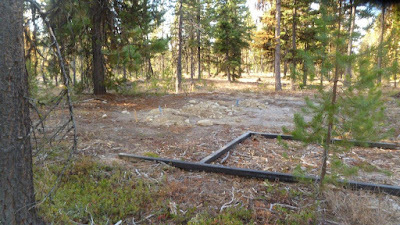 The next inspection by the Forest Service engineer will determine if this requirement has been met. In less than three weeks, between July 2nd and 20th, about 180 volunteer hours were spent by about 20 MVBCH members, some of them bringing their own tractors and trailers. They cleared the areas in each campsite where the picnic table, fire ring and high line will be located. 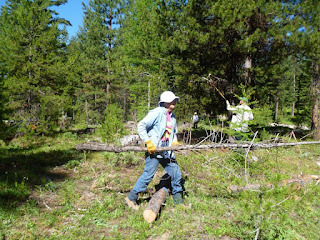 The community meeting area was cleared and branches were removed where they impinged on the road. 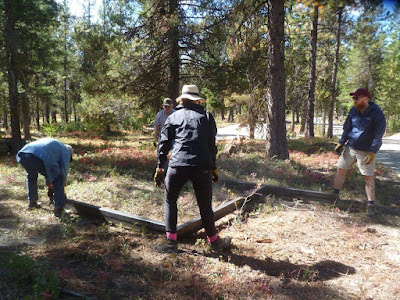 In addition, members moved the contents of the decommissioned Forest Service JR Campground to NSHC, about a mile away along Highway 20. 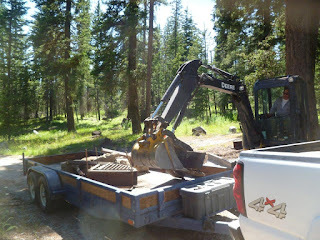 This Forest Service donation provided some of the picnic tables and fire rings needed for the six campsites in the 1st phase of NSHC, as well as some signage, fencing etc. Forest Service staff helped to uproot the equipment with a mini excavator, and MVBCH members moved and unloaded it at NSHC using their own tractors and trailers. 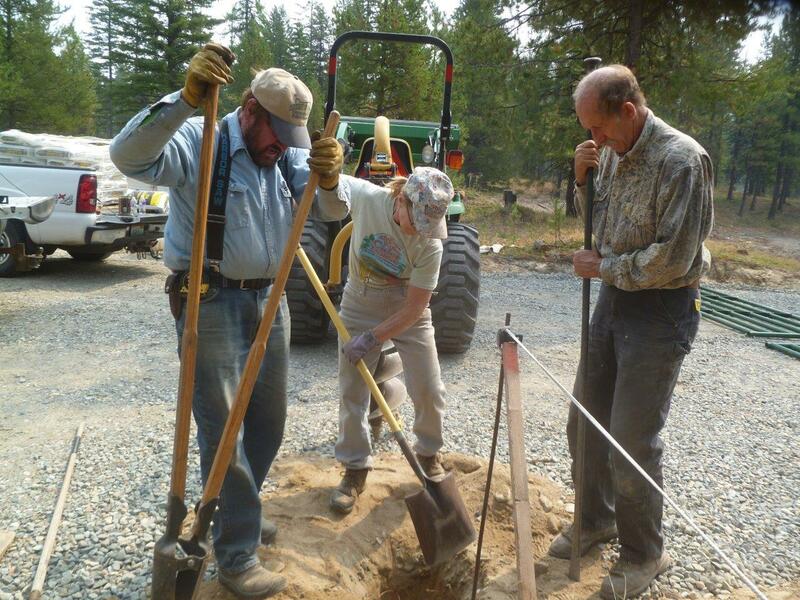 We appreciate the help that members of Okanogan Chapter gave at one of the work parties. 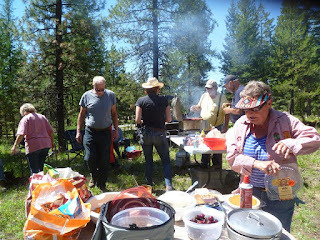 They also provided a most welcome barbecue lunch with hot dogs. 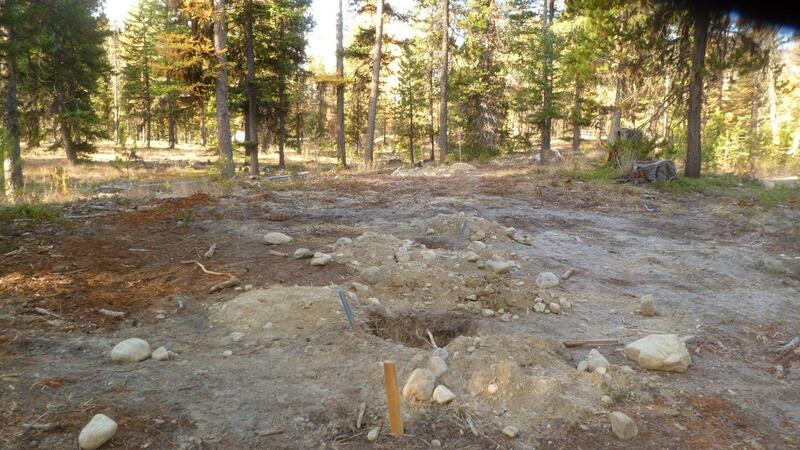 We are now asking for financial help from other chapters to complete Phase 1 of this campground. This includes development of the first six of 12 individual campsites, construction of a highline/hitch rack for each completed campsite, signage, bulletin board, manure bunkers and fencing. 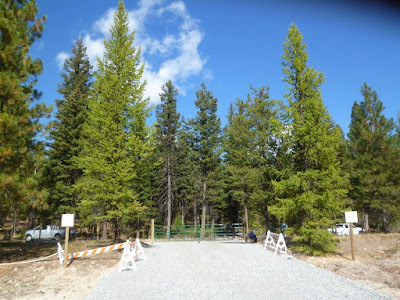 The campground cannot be used until the Forest Service approves the completion of requirements for Phase 1, nor can we proceed with Phase 2. MVBCH has covered the major costs (construction and gravel), using some of the income from our Spring Ride, and with the help of donations from several of our own individual and family members (plus a donation from family members of another chapter). We also thank Wenatchee and Pierce County chapters for their support. Can you or your chapter help? 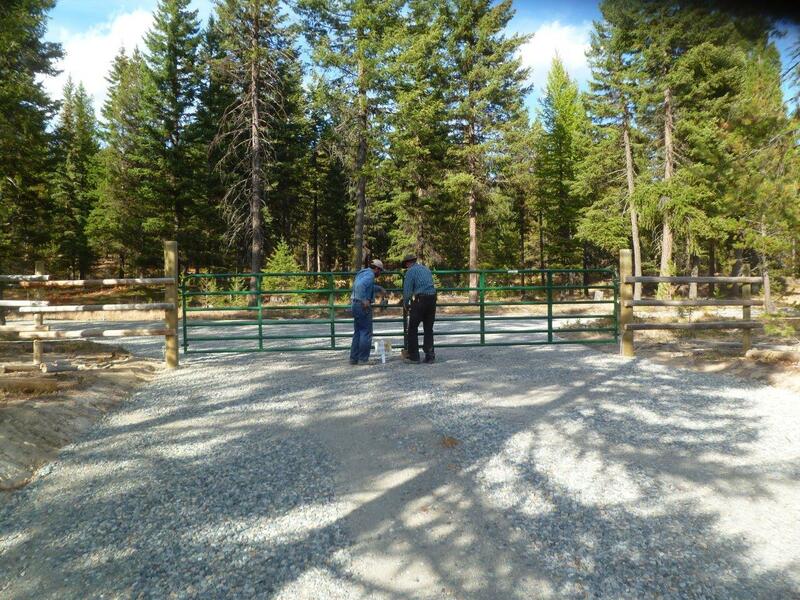 The North Summit Horse Campground is for use by anyone. 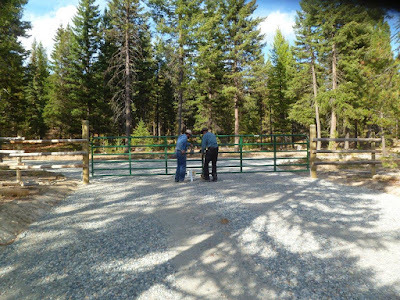 It is easy to reach, just off State Route 20, it gives access to many trails and it will be a first rate facility for riders and horses of all levels of ability. Not too many more horse campgrounds (if any) will be built on Forest Service land in this state. Visit MVBCH.com for updates on the North Summit Horse Campground. 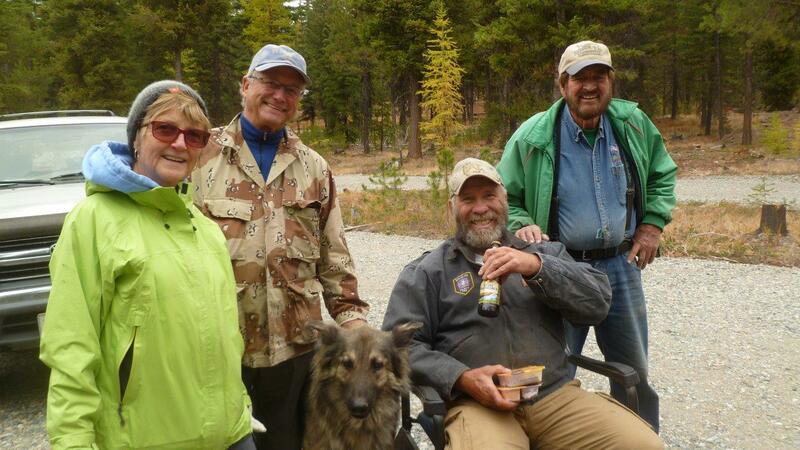 The first three weeks of July saw great activity at the North Summit Horse Campground (NSHC). 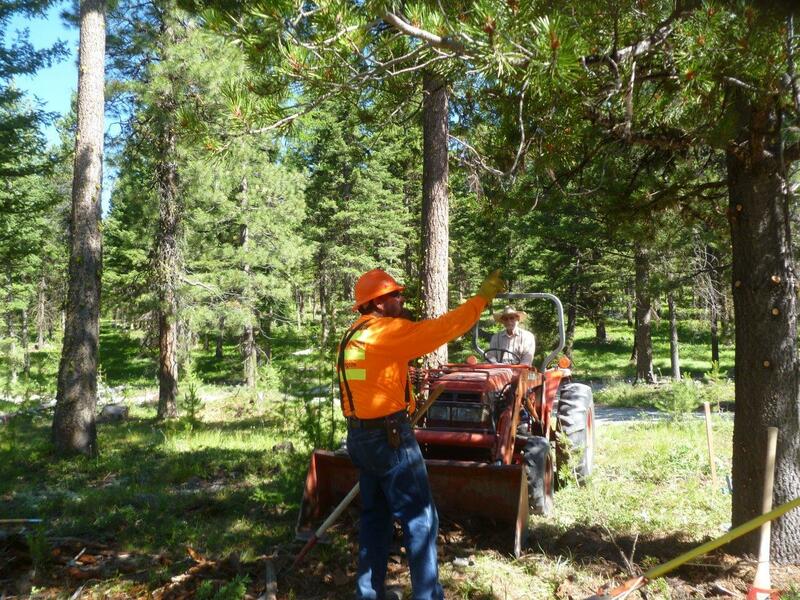 Construction activity during this period has involved much time and machinery and has been costly. 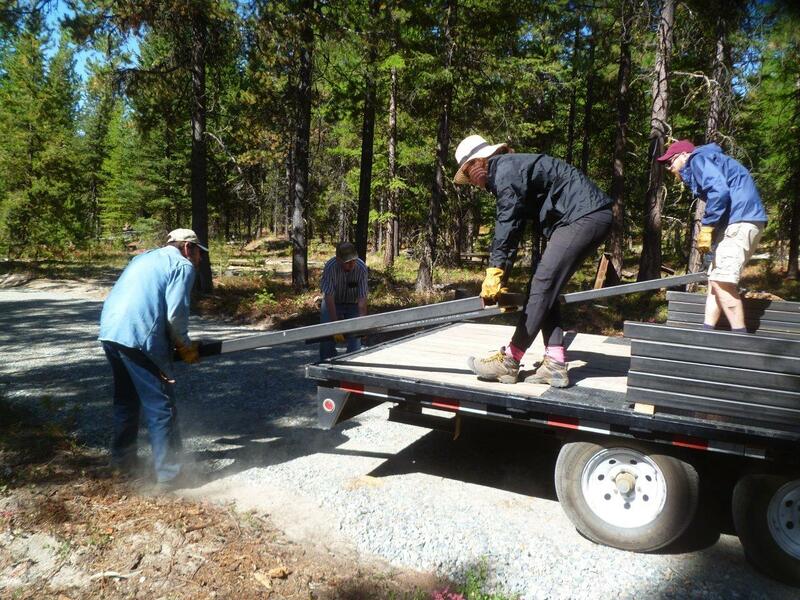 The 20 or so members who contributed some 180 volunteer hours on site could see a transformation as they worked. 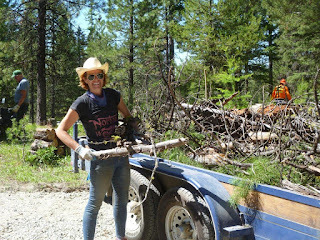 We helped the contractor remove branches etc. from the areas to be graveled. Gravel was delivered, and was spread and compacted on the roads and pull-through campsites by our contractor, Mike McHugh. 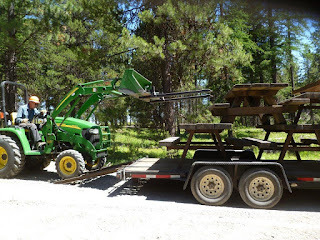 Equipment (picnic tables, fire rings, signage, fencing etc.) from the decommissioned Forest Service JR Campground was uprooted with the help of Forest Service staff, Mike Harmon and Dave, and MVBCH members moved it and unloaded it at NSHC using their own trailers and tractors. We worked to clear the common area and areas in four of the individual campsites where the table, fire ring and high line were to be sited. July 2nd was the first of nine days of gravel delivery. There were four delivery days in each of the first two weeks and a final day on July 18th. An average of five loads was hauled up from Winthrop on each day of delivery. 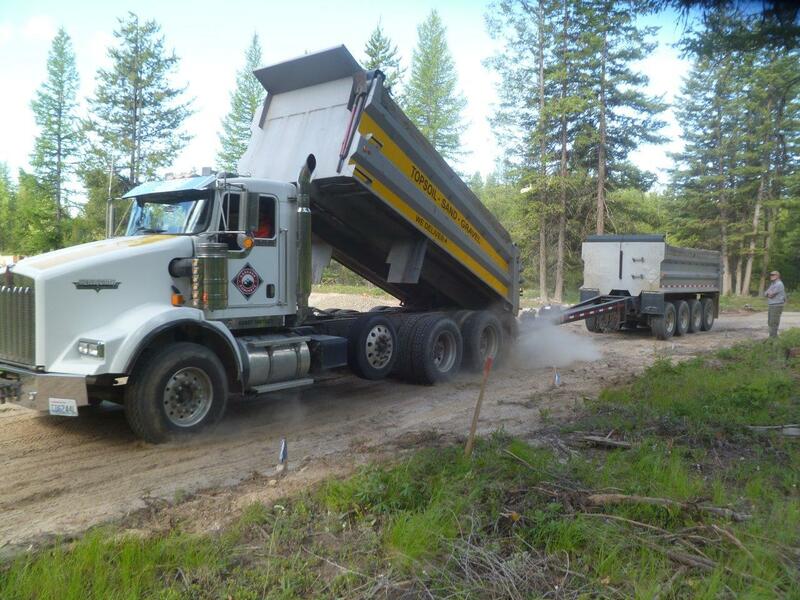 In all over 1,400 tons of gravel have been purchased so far. A major work party was organized on July 12th to move the equipment from JR Campground and to start clearing the common area. 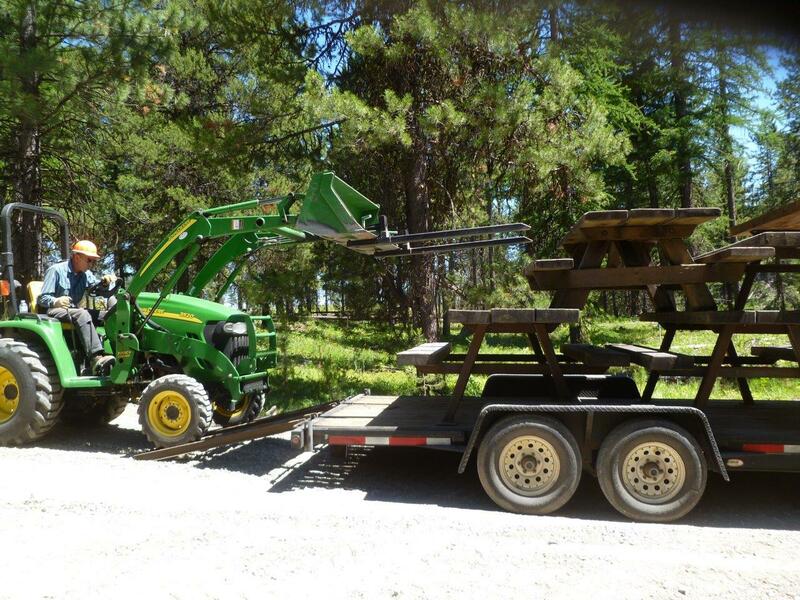 Willie Kemper and Pete Stoothoff brought their tractors and Bill brought a flat-bed trailer. 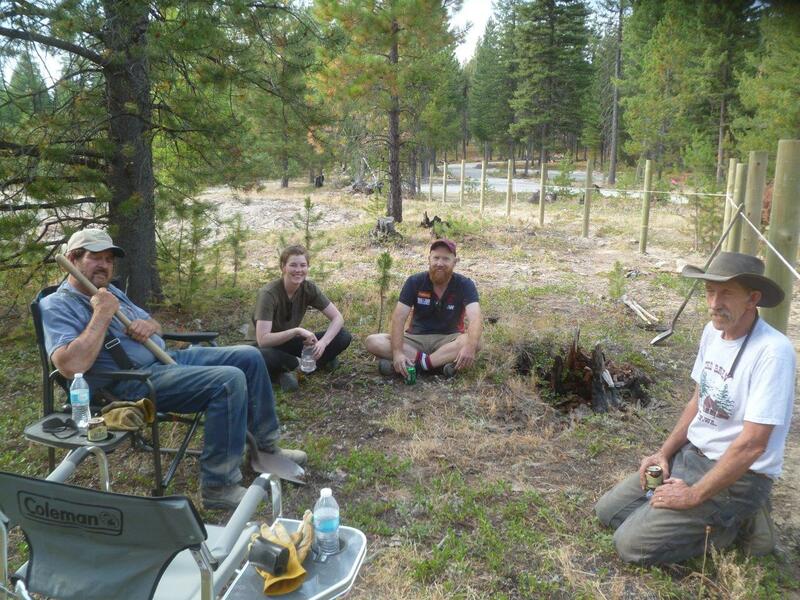 A great deal was achieved this day; some members worked through until 6pm to get fire rings etc. unloaded. 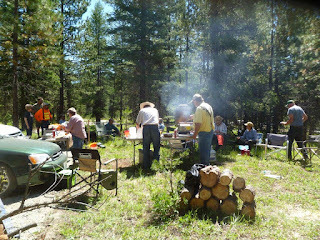 Members from Okanogan Chapter helped us on this work party, not only with the labor, but also by bringing a barbecue and hotdogs. This was really appreciated by all of us there. "Charge of the Light Brigade"?? Lunch time on the 12th!! Lunch time on the 12th! Mike McHugh, our contractor, started work on June 13th and continued work through June 22nd. 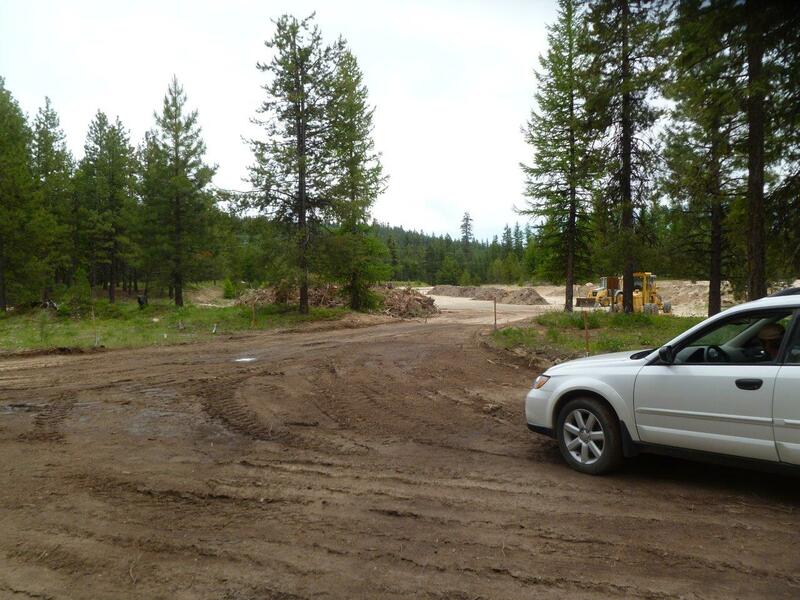 Roads and pull-through camp sites were leveled. Additional rock was brought in to firm up soft, wet areas on the roads. A roller was used to compact the roads after water was sprayed on them (it was very dusty). 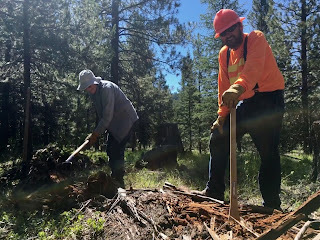 We are now ready for the next step which is to obtain Forest Service approval of the work done so far before the roads can be graveled. The inspection will be on Monday June 25th. 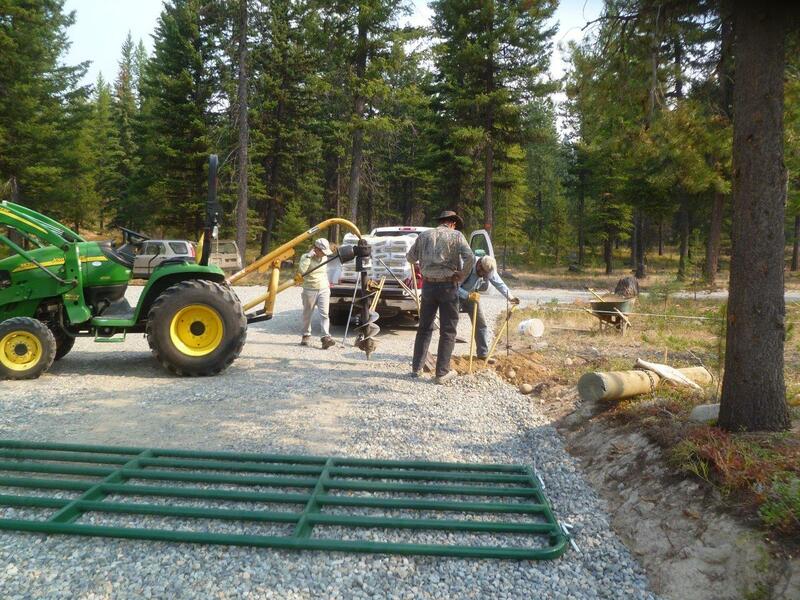 After that, 1200 tons of gravel will be brought in to spread on the prepared roads and campsites. 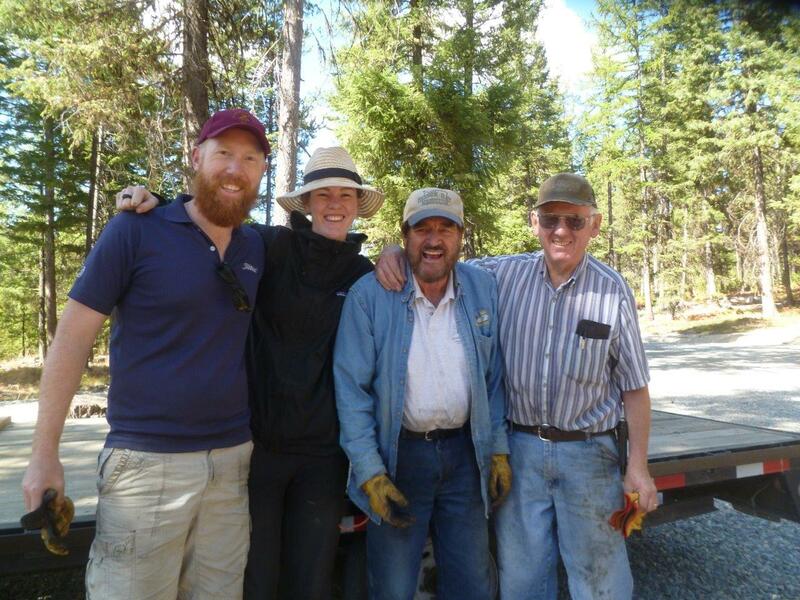 A work party to move amenities from the de-commissioned J.R. 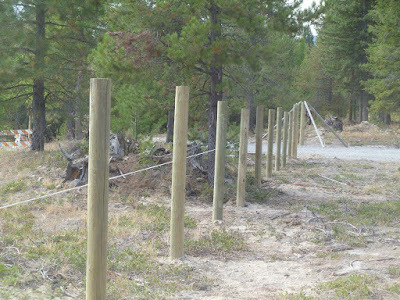 Campground (fences, fire rings, signs, picnic tables, etc.) is tentatively scheduled for July 12th. 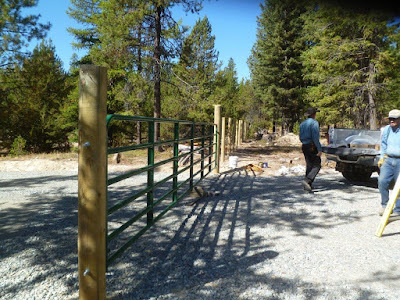 This will be an important step in the development of the horse campground and we need a big turnout to accomplish this. ...to make a smooth and solid interior road. The main entrance to the campground. 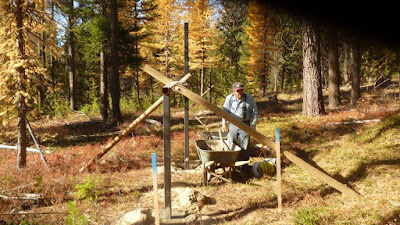 Turning right to the 1st pull-through. 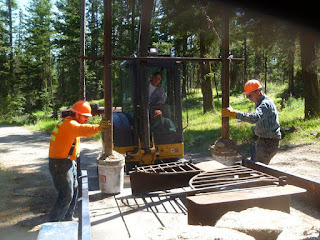 Continuing on past the 2nd pull-through. ...and the 4th pull-through, and so on past the 5th and 6th. Parking is available for day visitors. The Methow Valley Back Country Horsemen (MVBCH) approached the Methow Ranger District (MRD) about seven years ago to discuss establishing a horse campground across the valley from the established Twisp River Horse Campground. 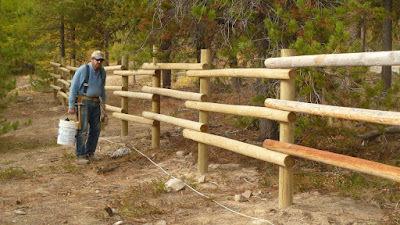 In the Loup Loup Summit area there are many scenic trails to be enjoyed by experienced and novice equestrians alike, with stock of all levels of ability. 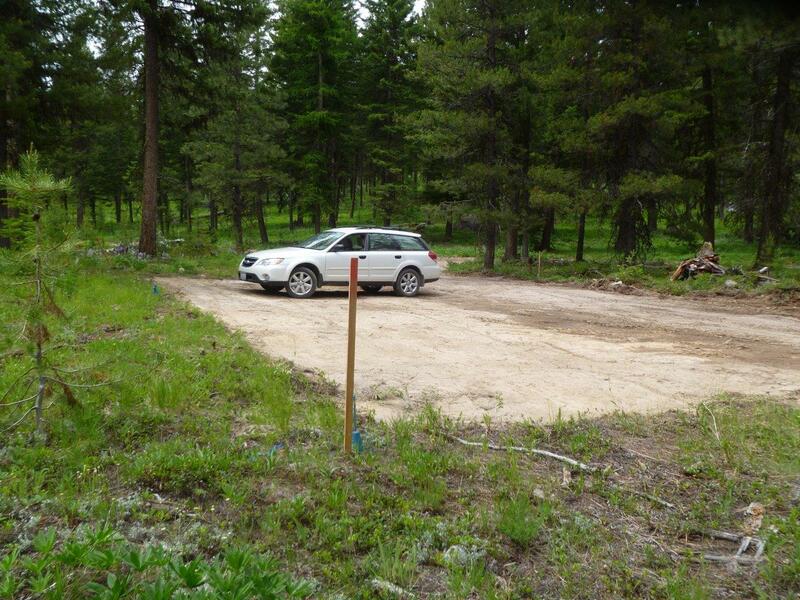 After several possible sites had been considered, MVD and MVBCH agreed on the North Summit Campground location. MVBCH has paid the Forest Service (FS) $5,918 for design and engineering in a 2014 agreement. An additional $4,300 was paid to Tackman Surveying for three surveys. 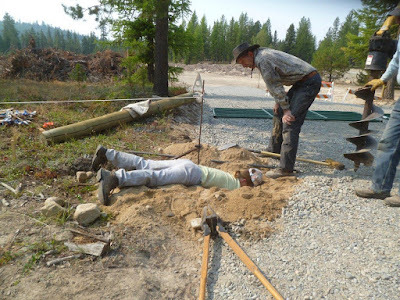 A 2013 Title II grant of $5,103 went to the creation of a site plan. The 2016 Title II grant of approximately $21,000 has gone to FS salaries. 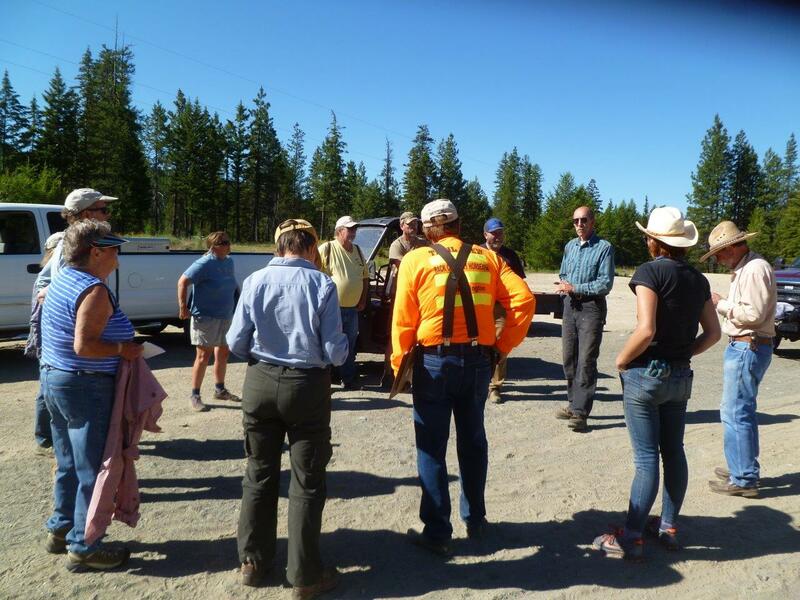 Finally, on September 15th 2017, an agreement to develop the North Summit Horse Campground was signed by the Supervisor of the Okanogan/Wenatchee FS. Preliminary road construction in 2017 was $9,752. Cost to MVBCH so far has been $19,970. Phase 1 will add about $30,248 more to the MVBCH contribution. 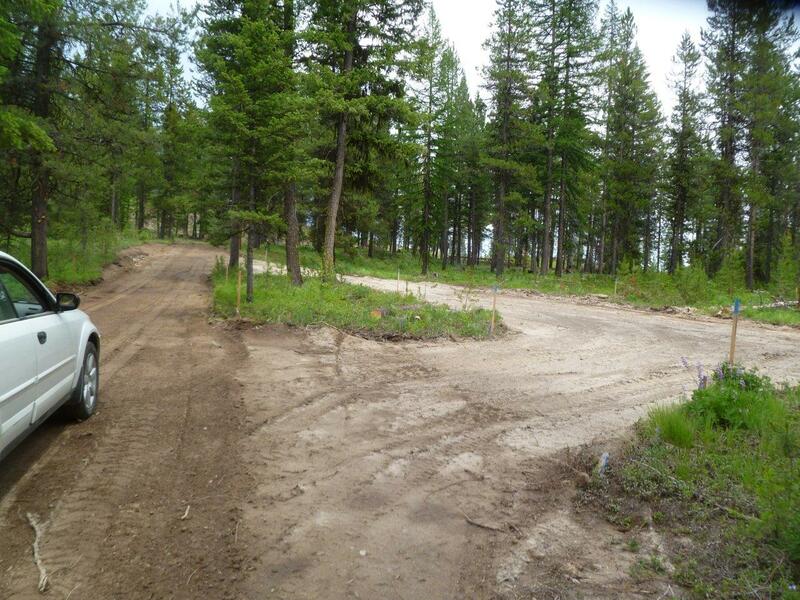 The entrance and front fence and campground roads will be constructed, as well as six complete sites. Each site will have a compacted gravel pad, table, fire ring and highline for four horses. 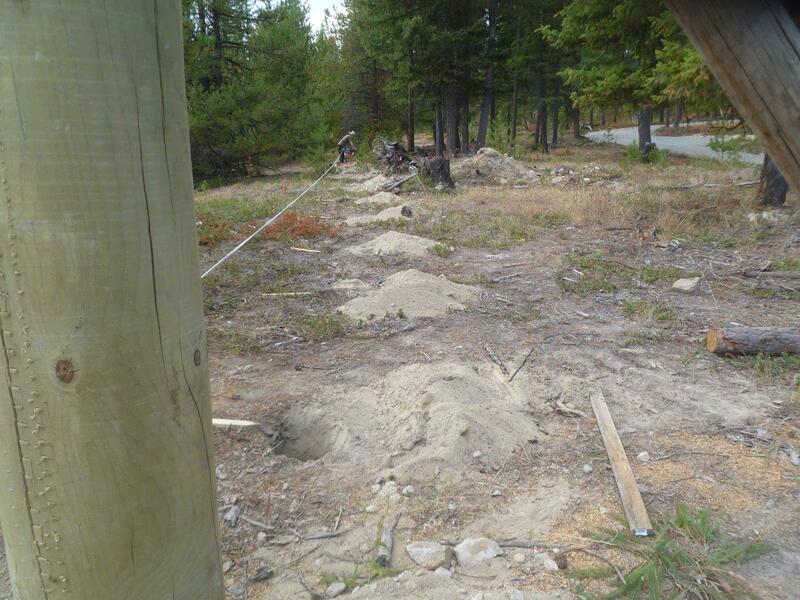 Two manure bunkers will be sited within the camp. Phase 1 will be a dry camp with a toilet within walking distance. Total cost for Phase 1 construction will be approximately $76,321, including about $50,218 from the MVBCH Chapter. Phase 2 will begin after a ‘sufficient use’ study period and after securing grant funds and /or donations from individuals or organizations. 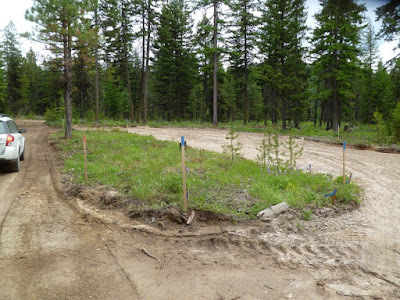 During Phase 2 the last six campsites will be developed along with bathrooms, more manure bunkers, horse water and a large picnic shelter in the middle of the camp. 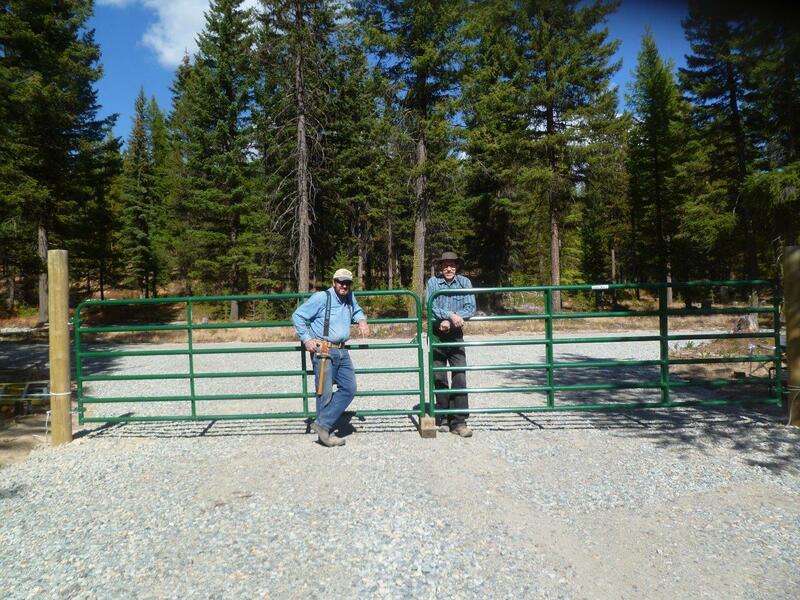 MVBCH is asking for donations to be used specifically for the development of the North Summit Horse Campground. Our chapter is proposing single campsite sponsorship for $2,500. 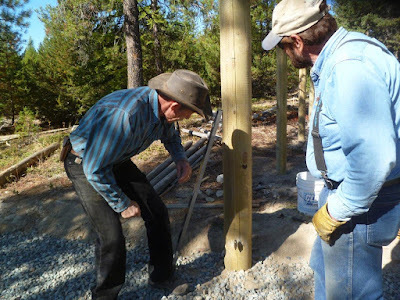 Sponsors may be individuals, chapters, or other groups of people or organizations. 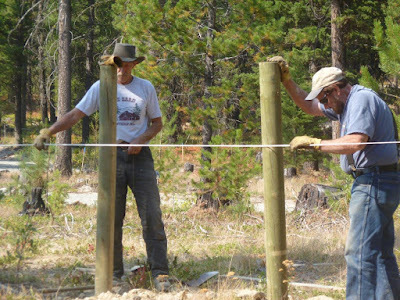 The sponsors will be recognized on the campground bulletin board. To date, we already have a sponsor for one site. Individuals and organizations will be recognized for smaller donations. 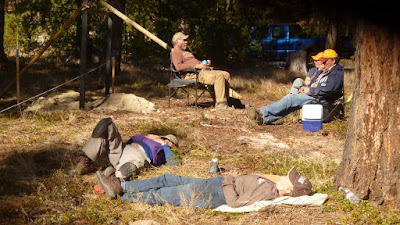 So, the campground is in the Loup area? Yes, the campground is located in the same entrance off Hwy #20 as the LoupLoup Ski Bowl. This is so awsome! Thank you.